Yes, you read that right! The generous owners of WaterLeaf Boutique want you to win a Klean Kanteen. They are going to be giving one away every day for the rest of the month of April! They retail for $15! Then, on Earth Day, you can enter to win a gorgeous ISSI necklace from them as well! WOW! WaterLeaf is a truly unique shopping experience. They carry gifts and stationery for all occasions, and all of their items are chosen with great care. The array of products found at WaterLeaf is in many instances earth-friendly, handmade and/or produced by vendors that are fair trade certified. They often work with vendors that give a portion of their proceeds to charities or that provide opportunities to those in difficult circumstances. At WaterLeaf, they are devoted to preserving the environment and aiding those in need while providing distinctive products and excellent services. This wonderful Boutique embodies all of the qualities that I think are especially important. I spoke with Ana Barron, owner of WaterLeaf Boutique, the other day and she was so nice and genuine. I love that she not only wants people to realize how important protecting our environment is but she also helps to support charities and organizations through the eco-friendly and fair trade items she carries. Thank you WaterLeaf for offering a Klean Kanteen a day for 22 days. Want to enter to win? Head over to WaterLeaf Boutique and pick out your favorite item that they carry. You can enter once a day but you need to pick out a new product each day. I will be picking the winner each day and emailing them for their address. I will need your email address in your entry! Small and lightweight, the 12 oz bottle is great when space is limited. It’s the perfect size for juice and other naturally sweet drinks, and rumor has it that grown-up Klean Kanteen fans commonly use it as a flask. Whatever you fill it with, the 12 oz Klean Kanteen's compact size allows you to take it just about anywhere. Toss it in your purse when you head to the store. Tuck it into your jam-packed messenger bag on your way to work. Pack it in your backpack for a quick hike or a trail run. It's the best choice for those times when the trip is short and refills are readily available, or you don't have a lot of room and you don't want to carry extra weight. Like every Klean Kanteen, the 12 oz bottle is made of 100% recyclable, high-quality, food-grade stainless steel, so it doesn’t need a special lining like some other metal bottles. It’s completely BPA-free and won’t leach chemicals, toxins, or funky flavors into your water, juice, smoothie, or drink of choice. Plus it weighs only 6 oz and is incredibly durable, so you can reuse it for years. The large-mouth design fits ice cubes and makes cleaning your Klean Kanteen as simple as scrubbing it with soap and water or throwing it in the dishwasher. Yet the slim design fits into just about any cup holder. Day after day, year after year, your Klean Kanteen will keep your drinks fresh, crisp and clean tasting. The Ballpark Cuff Links are super cool! I love the BBK-Rattles (Fruit). I like the Biodegradable Umbrellas. I've never seen a product like that before, very cool. Sorry for the deleted comment, I forgot to include my email address, which is: ebickell (at) hotmail (dot) com. I love the B Happy Bags! I like the Superhealer, perfect for my super dry hands and tiny cuts from my over use of purell. Eek!!! This site is awesome. Ok, well I wouldn't feel right if I didn't put my first pick down as the ARA-Large Eco Animals Panda!!! We are panda freaks and he is oh so cute! The Asleep/Awake Sign is cute & useful! I like the Mimi the Sardine lunch bags! Thanks! 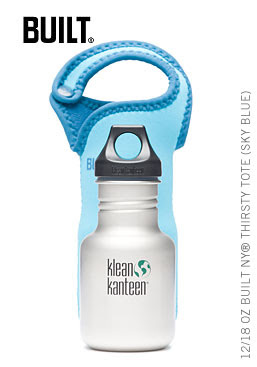 also love the klean canteen giveaway...hooray! Thanks for the giveaway! I could really use the organic PGO facial scrub since I have seriously sensitive skin! Today I'm going to pick the PDC-Rolled Cut Cake which looks like it would make a super gift, what awesome packaging! I like the shea butter soap in the Orange Patch Scent. I can smell it already! The ES-Soup/Cereal Bowl is really nice. Love the Night Owl Organic Baby Blanket! I'm diggin' the Baby Rememberance Box!! Ooh the Elizabeth Antique necklace is beautiful! I love the BHB-Happy Bag in Tess. Thanks for entering me! I love the cats & dogs Lunchbug bag! Too cute! GDC-Dog Collar - didn't know my dogs could go green too!! I like the Raspberry Hydrating Toner. Thanks for the giveaway! I really like the Runaway Backpack. I love the look of the recycled juice packs! I like the GYM-Fancy Mod Pendant. Ooh, the GYM lotus ring, so pretty! I like the DRN-Messenger Bag. I'm addicted to purses and the LTE-Cyclone Bag is great! Today's pick: DF- Purse Mirror - Rosetta. I like the CB - City Walks book for New York. Looks great! Thanks! the WCS-Roots & Shoots Plate is so cute!! I love their bags, especially the DRN-Hipster Bag...too cute. The GS- Alphabet Seal is neat. So great! I love the DRN-Hipster Bag. Thanks! I love the PGO-Organic Facial Scrub, bet it would be wonderful for the skin! The PGO Organic Soap Bar sounds great! I like the book Yoga Planet. Thanks! I love the DRN-Hipster Bag! Love the looks of the RGZ-Runaway Backpack. Juice bags! I like the KL- Music Box in Lullaby. The GSP-Southwest Flavors looks like a good book. First off, I love that they are based in NJ like me! Buying local -- nice! I LOVE the BBK Fruit and Veggie rattles! My daughter would love them! The Cats and Dogs MTS lunch box is really cute! I like the children's book "Whole World." Thanks! Love the Pedestal Cake Plate, so pretty! PGO-Organic Lip Balm in Egyptian Fennel sounds fantastic! The grapefruit/sweet orange combination really sounds good together. I love the couple on a swing notecard. The Ladybug Lunchbag is really cute! DRN-Hipster Bag is SO cute, expensive for me, but cute!!! The Pangea Organics Facial Scrub looks great, it sounds like it'd smell good too! Today's pick: MM-Anniversary-Beaded Greeting Card. My dogs would enjoy playing with the Hemp Biscuit! I love the Frog Children's Bath Towel! Today I love the Purse Mirror- Dragonfly. I love the shade of green and the silver dragonfly on the green sticks out nicely. WCS-Roots & Shoots Plate - so pretty! The Merry Christmas win gift bag is beautiful! I like the PWP - 14"Square. I love the Falling Leaf purse mirror. Very nice! I like the Lunchbug in the Cat and Dog print! DF- Purse Mirror - Rosetta, This is soooo pretty! My favorite item there is the KL Music box. I love the Celeste bag! I love the MD-City Girl Bag...it's so funky! I like Pangea Organics and would try their bar soaps. Thanks! I like the red flower Hanging Calendar! I like the BHB Handbag. I like the Red Pendant. I like the Wrought Irony Plate. Thanks! The KL- Rememberance Box is really lovely. The product I like is the biodegradable umbrella. It is so whimsical! I like the MTS-LunchBug in the lady bug print. Cute! The SGC handhelp sounds nice. Today's pick: Wrought Irony Plate. I like the HBB-Shea Butter Soap in orange patch. I'd love to try the PGO organic lip balm. The FF - Peridot Necklace is pretty. I love the hipster bag! I like the GYM fancy lotus ring. CPM- Take Time Book sounds nice, I love inspiration quotations. I would love to check out the book Southwest Flavors. Sounds yummy! Today's pick: Take Time Book. The hipster bag rocks! Thanks for the giveaway! Love the splash bowl and the metal measuring spoons. They have a lot of fabulous items. oops email is danamarkraz at gmail,dot,com. I like the DRN-Hipster Bag. The mojito Shea Butter Soap sounds yummy! The Organic Shower Gel looks like a great way to start the day! BBP-Whole World looks like a fun read! Today's pick BHB Happy Bag. Thanks! book "Whole World" for today! Love the FK - children's bath towel in blue bunny. Today's entry: GYM-Fancy Mod Pendant. Thanks! The BN Flower honeypot is gorgeous! I love the Aqua Pedestal Cake Plate!! I LOVE the Roots & Shoots Plate! The Dragon Fly Mirror is lovely. Thanks. I like the PKS alphabet charms! I love the lunch bags...such cute patterns! Today's entry: Dragon Fly Mirror. Thanks! I love the lunchbug! What a cute bag. Especially with the blue frog fabric! i've always wanted a kanteen bottle! i love the Marble Whole Cake. I love the Asleep/Awake sign. AIPD-Jewelry Mirror is my favorite! I like the DRN Hipster Bag in Eggplant! I like the lunch bug, really cute, great idea. the Blabla fruit & veggie rattles are the best! wow...everything is fabulous....lovin' the jewelry mirror and the doggy hemp biscuit. I like the inspirational Follow Your Heart mug. Baby rememberence box. So sweet! well, I guess all good things come to an end - if I've counted correctly, this must be the 22nd day! My pick today is the The Northwest Green Home Primer by Kathleen O'Brien and Kathleen Smith. Um I know I put one of the Antique pendants before but I just need to say they are ALL pretty!